A particularly elegant roofbar-mounted Cycle Carrier from Thule. The Thule Freeride 532 Cycle Carrier is easy to use, likeable and lockable. Designed to take almost any bike - even if it has oversized or ovalised frame tubing. A particularly elegant roofbar-mounted Cycle Carrier from Thule - the Swedish world leaders in roof rack solutions. Secure - the Thule Freeride 532 Cycle Carrier locks onto the roof bars. The bike locks on to the carrier. Versatile - the Thule Freeride 532 Cycle Carrier fits either square and aero roofbars. Handsome - the Thule Freeride 532 Cycle Carrier's elegant curved lines and titanium-like finish look good on any car. Safe - the frame down tube holding clamp is padded to protect the bike's finish. The frame down tube holding clamp's Quick Lock helps protect the bike from theft. Takes 22-70mm diameter round down tubes, or oval down tubes up to 80mm cross-section. Smart wheel holders with adjustable ratchet straps secure any size of wheel. Convenient - the carrier is pre-assembled, no tools are required. Unobtrusive - when not in use, the cycle carrier folds down, almost flush with the roof bars. 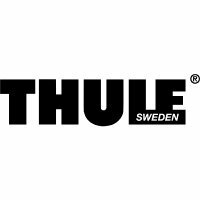 Compatible with Thule keyed-alike system - if you own, say, more than one Thule Freeride, you can replace the locking cyclinders so that all your Thule products use the same key. City-Crash-tested and TÜV-GS standards approved. Supplied with T-Track adapters (20x20mm) for mounting the carrier directly into the roof bars' T-tracks.